This fly is intended to imitate a worm that lives on pilings and docks among the mussels and barnacles. The live worms are about one and a half inches long and are deadly bait for pile perch and rubber lipped perch. Except for one nuisance tying phase this is a very simple fly to prepare. Jam the thread onto the shank just behind the hook eye. Wind a thread base back to a hook bend. Wind the thread back to a point opposite the hook point. Tie the machined brass eyes on top of and behind the hook point allowing the fly to ride hook point up. The tail is tied in behind the brass eyes and should be about a half inch longer than the hook. Keep the tail material sparse. The thread shield is placed on the fly to protect the thread wraps that hold the brass eyes to the hook from the ravages of the sand bottom. The weight is the part of the fly that takes the greatest beating during a retrieve. Taper the lace to provide a neat tie-in. This material can be purchased from a craft store. Lay the tapered lace on top of the base of the tail and tie it down. Wind the thread to the front of the brass eyes, hold down the lace material and tie it down, tightly, in front of the eyes. Cut the lace in a long taper that extends to the hook eye. This taper will start the tapered shape of the fly under body. Wind the thread forward to the hook eye. Fold two strands of hot orange Krystal Flash and tie the ends in behind the hook eye forming two large loops of Krystal Flash. Lay the Krystal Flash along the hook shank and wind the thread back to the brass eyes, filling in any thread voids. Tie in the hackle in front of the brass eyes and fold the hackle back into a material clip. Place a dubbing twister into the two loops of Krystal Flash and spin the twister till the four strands form a tight strand. Wind the thread to the hook eye then wind the twisted material forward in a tight spiral. Tie the material off and trim. This next step is important to insure durability of the palmered material. 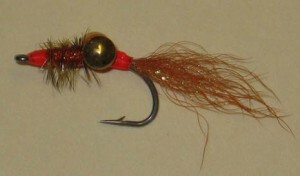 Coat the body of the fly with Softex and wind the hackle forward in open spirals while the Softex is still wet. Tie the hackle off and whip a tapered head. Epoxy can be substituted for Softex but it is a mess to work with. After the Softex has cured trim the palmered hackle so the body will be approximately a quarter inch in diameter.